These howling wolf with detailed mountain and tree cutout earrings feature a turquoise chip inlay moon. 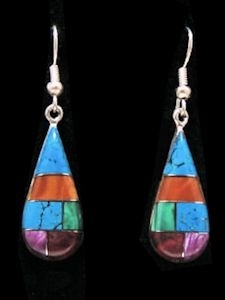 The earrings hang from hypoallergenic ear wires. They measure 2" (57mm) x 9/10th " (23mm).